"Vegetable thoran is a dry dish made in kerala cuisine prepared with any fresh vegetables.It is very easy and quick which goes well with rice." Wash all the vegetables thoroughly and drain out. 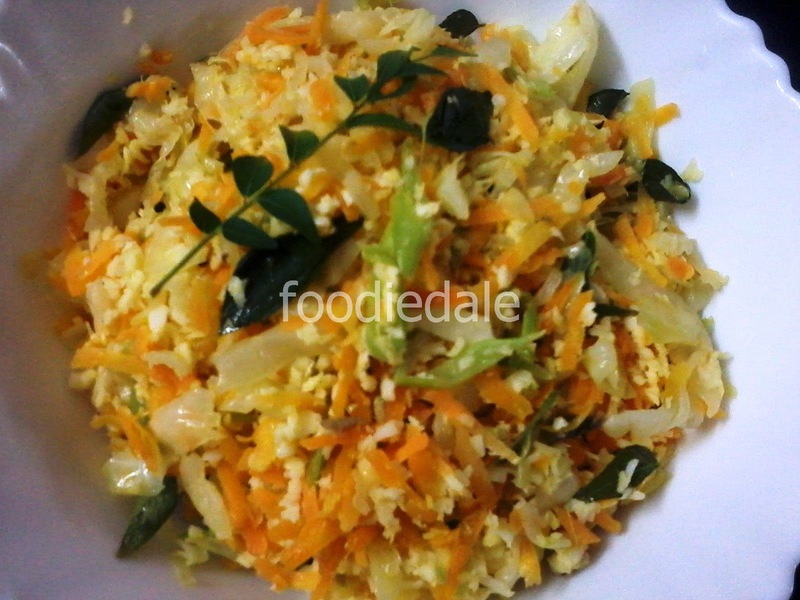 Grate the carrot and chop cabbage and beans. Now mix all the vegetable together and keep aside. Heat oil in a kadai or wok and splutter mustard seeds and saute it with curry leaves. Now put the vegetables and saute well by adding a pinch of salt and chopped ginger(here i use ginger(learnt from my mom) to remove the smell of cabbage and to bring fresh aroma)and keep it in a low flame uncovered. Meanwhile take grated coconut,cumin seeds,garlic and grind it together roughly. Now add these grinded mix into the vegetable and mix well. Keep it in a low flame for 2-3 minutes till done.